Often gardeners complain that raspberry gives little berries, what kind of hive is not dying, but the crop is weak that raspberry degenerates. Whether this is so, what is the cause of crop failure? Raspberry gives weak harvests in neglected gardens, where from year to year for plants not cared for. Plants annually grow old, press against each other and "fight" for a place under the sun. So the bushes have no time to care about the berries. Raspberry biologically cannot be degenerate, as it is perennial and in one place can grow up to 12 years. The choice of a location for growth is an important condition. 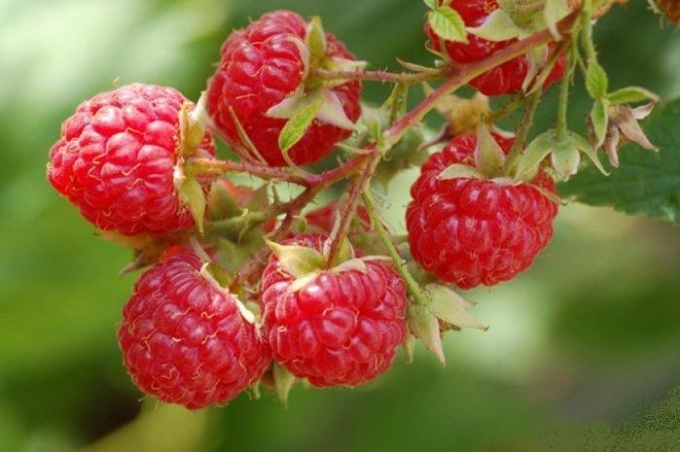 Raspberry is a plant that loves sun, good air - permeable, moderately moist fertile soil. If you have the opportunity to make organics, put it under the raspberry bushes. Neither currants nor Apple is not in need of humus as raspberry. Raspberries should be grown on a trellis. The branches must grow in direct and not along the ground. The exceptions are varieties with erect stems. When planting raspberry plants should be in the 45-50 cm apart, between the rows need to leave 50-60 cm For such planting easy to maintain plants well purged and illuminated by the sun. Annual inspection of the plants, cutting otplodonosivshih, patients affected by pests and branches to help improve the raspberry bushes and to increase the yield next year. What shoots are fruit-bearing raspberries? Raspberry Bush has shoots of two ages. Shoots of the current year and last year. The crop of berries formed mainly on the branches of last year. After ripening, these branches finish their life cycle and shrink. Exceptions are only everbearing varieties, which give a small crop of shoots of the current year. Why it is necessary to pruning raspberries? Cut old, who gave the harvest, the branches in the autumn. This ongoing operation stimulates the growth of underground shoots. They will replace the cut, the sick and the weak. In areas where snow cover is small, pruning can be carried out in the spring. Old shoots in winters contribute to retention.